Simrad AP24 Autopilot combines space saving design with state of the art auto steering, making it the perfect choice when space is at a premium. Simrad AP24 Autopilot include a number of self calibrating features that automatically compensate for the unique handling characteristics of your boat and sea conditions, insuring optimum performance without the need for expert manual calibration. Simrad engineering ensures that you can always go to sea in the confidence that your Autopilot is pin-point accurate and highly reliable. The Simrad AP24 Autopilot boasts state of the art technology so you know you'll be safe, you know you'll hit your way points and you know that you'll arrive on time. But what about en-route? 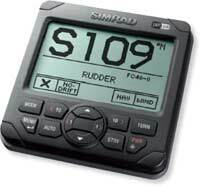 What can the Simrad AP24 Autopilot do for you?